In the garden, termites are probably not a huge issue other than possibly nibbling on your tomato stakes or attacking wooden fence posts. Greenhouses and garden sheds, however, are definitely susceptible to termite attack if they are built of wood. These structures may not be as valuable as your house, but it can still be irritating, and in some cases expensive and time consuming to have to repair or rebuild even smaller structures or replace fences. 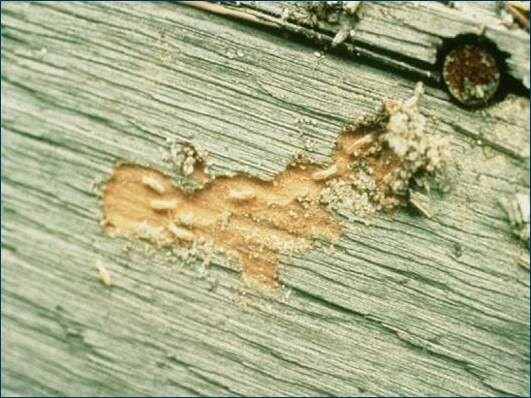 What can you do to prevent termite attack, or at least reduce their "need to feed" on your structures? Fortunately, there are several things you can do, without exposing your precious garden plants to materials that could push the word "organic" far away from the fruits (and vegetables) of your labors. One of the best things to do is simply keep wood away from the soil. For existing buildings this may be difficult or impractical if the structure was built with wood contacting the ground. If you are building a new structure, concrete foundation blocks with galvanized metal shields on top can provide the separation needed from the soil and moisture. The metal shields will keep moisture that wicks up through the concrete blocks away from the wood. Excessive moisture in these areas can accelerate rot, which can cause as many problems as termites. It is still best to use pressure treated wood for base plates and other wood members close to the ground since they are the hardest to replace if damaged. Pressure treated wood is impregnated with materials that protect it from termites and rot. These materials are tightly bound within the wood so they resist leaching. This reduces the possibility of contamination of soil or other things in the area. Although some pressure treated wood can be used in contact with the ground, much of it is not rated for ground contact. There is a stamp on pressure-treated wood that gives the usage rating. Treated landscaping timbers, for instance, are not usually rated the same as pressure treated fence posts. 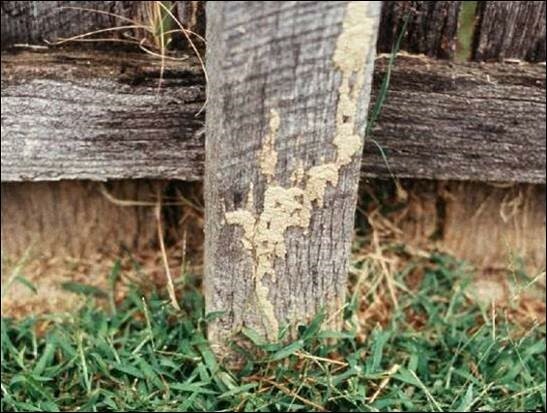 They are more susceptible to termites and rot, and will not last as long if they are used for fence posts. Other wood treatment options such as borate-based products will kill termites and help control rot, but they are phytotoxic. If used improperly they can kill plants and even contaminate the soil to the point that nothing will grow in the area. Professional termite control specialists often use termite baits. This is a very effective method of termite control as it eliminates the entire termite colony in the area of treatment. The active ingredient is a chitin synthesis inhibitor that disables the termites' ability to molt, and affects the entire colony. Effective termite bait systems must be maintained in bait stations by a professional and are mostly reserved for residential or commercial structures. It is a good idea to consult with a pest management professional to see if this would be a viable option for your smaller buildings as well.